Update 9.0 - Live Now! 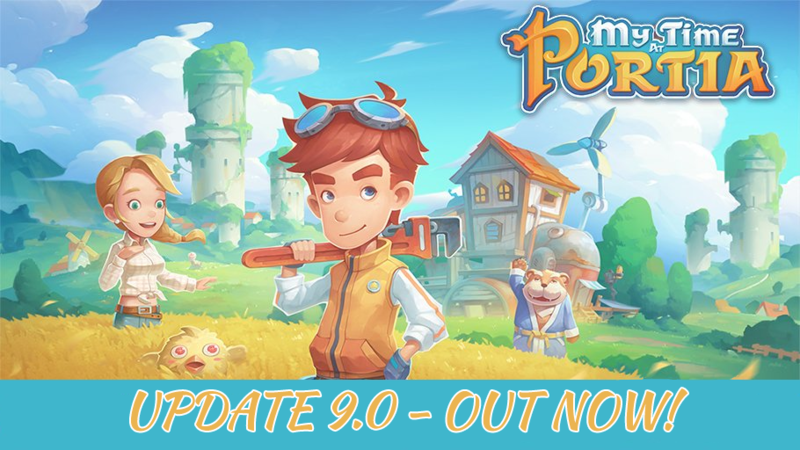 Update 9.0 is here, bringing with it new content, bug fixes and more! The first thing you should notice with the new build is our work on optimization. All players should see an improvement in their frame rate and how the game runs on their system. This is great because it means you'll get an even smoother experience when playing the new content we’ve added! A brand-new area to explore, including new buildings. Updates to existing events such as Land Run and the Day of Memories Festival. 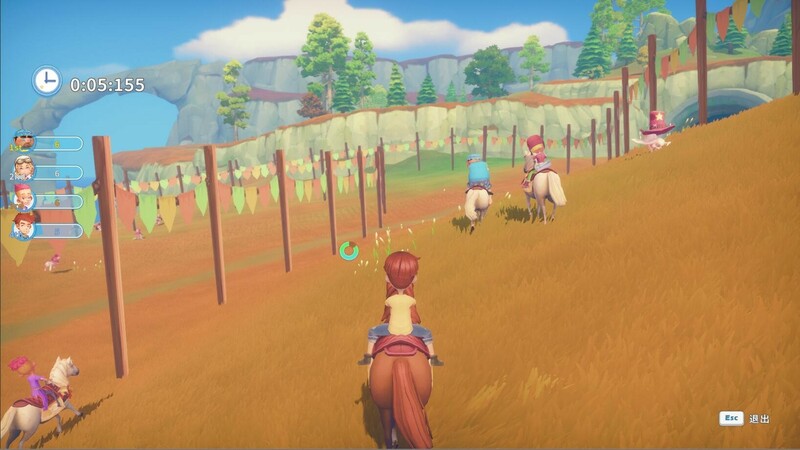 As many of you know, the Portia Land Run occurs every autumn in Portia following its addition in the previous update. Following its release, we felt that the Land Run had its limitations due to the player only being available to race against the clock, rather than other NPCs. But not anymore! We’ve added in racing against three other NPCs to make the event a lot more competitive. The original time attack race mode is still playable for Portians whose goal is purely to get the best time. 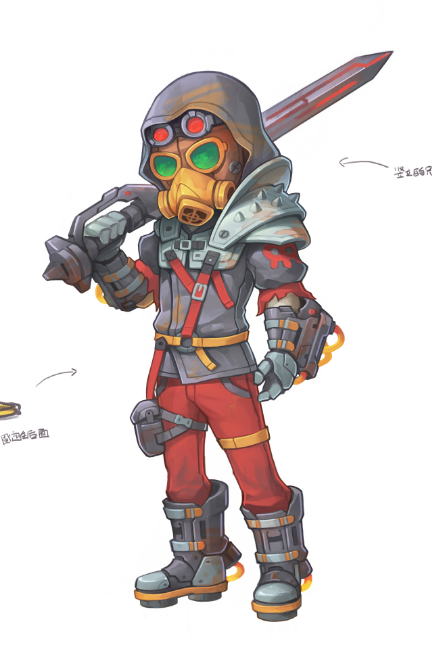 During the multi-character race, racers will be able to use items to increase their speed and add to stamina. May the best Portian win! 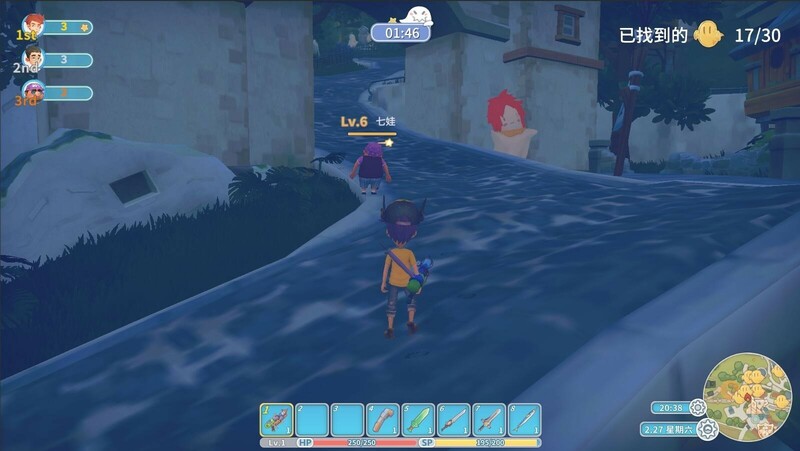 If you’ve already tried the Day of Memories Festival, then you’ll remember that the event asked the player to go around the city of Portia collecting Ghost Badges. This time, we’ve added in a few more interesting gameplay mechanics. New Ghost Badges will appear in the city every 30 seconds, they’ll be marked on the map for the player and NPCs to see! We have added ‘ghosts’ to the game, they’ll appear randomly to scare folks, if you don’t dodge them, you’ll be stunned for a bit. Spooky! Everyone will be armed with the Scare Soaker, a gun that can stun people for 3 seconds! You can use it, but so can NPCs. This should make things a little more interesting! We know we’re a little late with this build and we’re sorry to have kept you waiting, but it’s here, and we hope you enjoy it! There’s a lot more content we haven’t spoken about for you to discover in this update and we can’t wait to hear what you think of it! Be sure to let us know what you think of the new content and tweaks here on the Steam forum. If you encounter a bug, please send us an email, or leave us a post on the ‘Report a Problem’ sub-forum. Happy gaming everyone! Added a new storyline for Emily. Added new shop in south station where players can exchange their products into gols. Players can now assign commissions to the civil corps. They'll help you collect items from monsters. Added search function for material sources. Added a new workshop appearance. Added more furnitures in exchange store. Added cornball and apple tree. Added feather duster, so that players can pet multiple animals at the same time. Added floor cleaner, so that players can dismiss all the floorings and furnitures in a certain area. Added guide for revise and ride hunting. Added a function that enables NPCs to ask for a date. The indoor area of Happy Appartments is now open! Several NPCs now have their own facial expressions. Added name-change item for pets. Added feedback voices after petting animals. The picture in the album can be replaced. Added sound effect for petting chicks and ducks. Added maps for several houses. Added photo shoot event when riding a hot air balloon during a date. 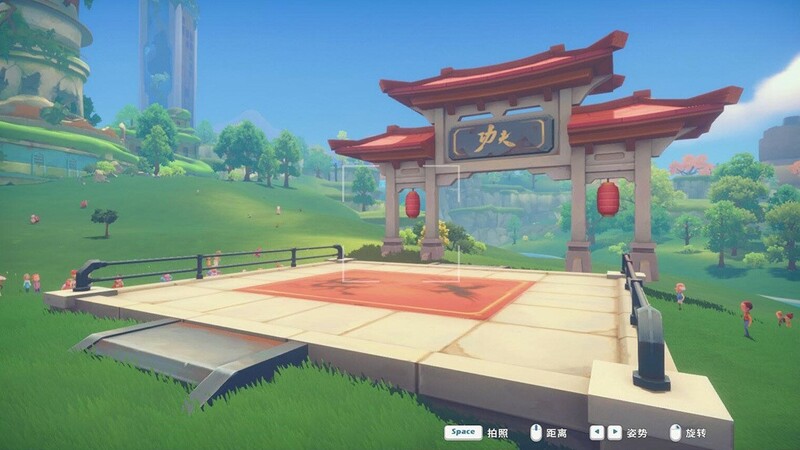 Added new in-game activity - Martial Arts Tournament.This occurs on the 12th and 13th of Feburary. Added new in-game activity - Snowball fight. This occurs on the 12th and 13th of April. Added new reaction when monsters get hit. Added new influence mechanic for the social network, it will effect a products' selling price in Yeye's shop, as well as the commissions' reward to the civil corps. Your spouse, who can help you with farming, can now also help you pet animals. Added new commissions that require more items to complete. Added new types of commissions that can increase the favor points. When Higgins get his daily commission, his workshop reputation point increases. Added button "play again" in several mini-games (playing dart, roping, and shooting balloons). Added three new dungeons with monsters inside. Gale's house, Alice's house and Arlo's house. You can now interact with NPCs while you're walking. Added three new NPCs and fighting postures. Added background music and sound effect for several cutscenes. Added sound of footsteps in dungeons. Adjusted the UI when holding items, and added items' name in the UI. The system will now automatically take a screenshot during cutscenes. If players skip the cutscene, then they will not be shown in the screenshot. If players didn't skip the cutscene, then players will be shown in the screenshot. Fishing can increase the experience point. Added button "play again" after fishing. Added new wallpapers and floorings. Added more items for players to inspect. Changed the rule of "Attempt to find item" in Day of Memories. Added Scraps related achievements and the achievements when taking adventures in the haunted cave, attempting to find items in the Day of Memories, fishing contest, and lighting the fireworks. Adjusted the reward UI interface. It will display items' name. Added a switch for turning on/off the snow & rain effect. If your relationship with NPC has reached friend or above, then this NPC's location will show up on the map. Added extra icon animation in the portrait in the social page when the relationship with NPC has reached lover. The factory will now return all the materials when crafting is canceled. Optimized the running of the game. Adjusted the price of several products. Adjusted the recipe of crafting.Decreased the required items. Adjusted the unlock requirement for "Well-rounded Workshop" and "Science Power". Increased the money Gust will send to playsers after marrying him. Adjusted the lasting time of several comsumptions. Optimized the behavior of NPCs. They're less easy to be interrupted now. Optimized the position when interacting with NPCs. Changed the birthday of Gust from Feburary 12th to Feburary 11th. You'll get a storage which stores all the additional items when you have a full inventory. Optimized the attacking experience of all the weapons. Adjusted the appearance of mission letters in the mailbox. Optimized the UI of factory. Deleted the unnecessary conversation while sending gift in the Day of Bright Sun. Adjusted the priority of overhead NPC chat. Adjusted the stamina display bar. The remaining stamina will not be displayed when players have 100% stamina. Fixed the bug where players would still get a mission reminder over Dr. Xu's head, even when there are no missions for him. Fixed the display timing error in UI when taking missions about photo-taking. Fixed the bug that there're two Alices in the cutscene of Alice getting married. Fixed the bug that the holiday background music woudn't stop when leaving out of the holiday area. Fixed the error in the conversation with QQ, Pinky, and Scraps while in the holidays or birthday. Fixed the conversation error while sending a sweetheart cake to a partner. Fixed the bug that made NPCs not go to have a hot-pot when re-loading a save during the Winter Solstice. Fixed the bug that caused NPCs to shake when riding the hot balloon. Fixed the bug where the date and play event cannot be triggered while having the buff that alters health. Fixed the bug that caused horses to follow players into the sparring when the players had multiple horses following them. Fixed the bug that the sound effect of swinging will keep playing if players don't do anything in that mini-game. Fixed the bug that caused the monsters' name in the album collection refers to the wrong monsters. Fixed the bug wjere horses will block the way when the players had multiple horses following them. Fixed the bug that caused the relic scanner to scan multiple times when the items overlap each other. Adjusted the lengh of the conversation when getting married. Fixed the issue when players got favor points from multiple NPCs at the same time that caused sound effects to be too loud. Fixed the bug that caused the game to not play the animation of lying on the floor before bed time after continuous fishing. Fixed the bug where entering the fishing competition will not cost the player any gols. Fixed the bug that players cannot load the game if they died while fishing. Fixed the spotlight in the abandoned ruins. Fixed the crack in the top of the abandoned ruins.Players will need to reset their ruins instance for this to take effect. Fixed the error in conversation after unlocking all the diagrams. Fixed the bug that caused the attribute of furnitures to change if the game was reloaded. Fixed the bug that caused the camera to stop working if players triggered the jealousy event during the dating mini-games. Fixed the bug that caused the game to freeze when players trigger the jealousy system after the dating mini-games. Fixed the bug where animals could not be placed on floorings. Fixed the bug that the guidance page cannot be closed by using the controller. Fixed the bug that caused characters to disappear. Fixed split 0 item bug.